1. NuTyX is fixed release, not rolling. 4. The package manager is Cards -- does this do dependency checking or not? I am basing this on info at distrowatch.org and my own testing and observations. Please correct if any of this is inaccurate. Assuming the above is accurate (or nearly so), is NuTyX committed to this sort of "configuration" (if you will) moving into the future? As it currently stands, this is the perfect arrangement for my needs and wants. I am currently trying to find an adequate platform for virtualbox hosting that will be at least as long-term stable as CentOS 6 has been. http://nutyx.org/en/old-news/2018-01-17.html See "NuTyX 9.1 packages moved"
Those binaries will be available as long I have space enought (20 GB) 13 G are used at the moment. So I take it that my list was correct. My only question is what your dictionary means by dependencies for compile time. I mean, if I need to install, say, an office suite and maybe that depends on other packages (fonts, etc), then cards will automatically install those dependencies; that is, I will not end up with a corrupted configuration. I think that is what you mean. I think NuTyX might be a good candidate. It would be helpful if I can get the virtualbox Guest Additions working, as that would make testing and evaluation easier (the clipboard does not work even though the modules are installed and loaded). My only question is what your dictionary means by dependencies for compile time. Compilation dependencies are specified in the recipe of the package. It would be helpful if I can get the virtualbox Guest Additions working, as that would make testing and evaluation easier (the clipboard does not work even though the modules are installed and loaded). I have done exactly that -- several times, too. But it keeps failing for some reason. The script seems to want "build_in_tmp" which does not exist. Thierry, I realize I am hitting you with all sorts of questions and issues, so thanks for your patience as I learn your system. I got rid of the /etc/bashrc because it was generating a string that got sent to the upper right of the bash window, partially obscuring output and scrambling the output when I tried to scroll back. I.e., it was getting too messy, so I removed it. Is there some reason this has to be there? 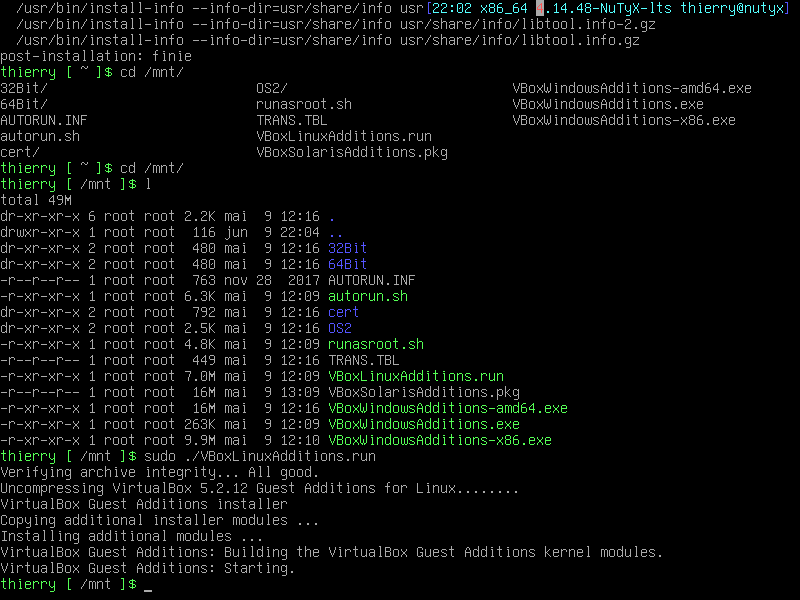 At any rate, I had already installed the kernel-lts.devel as required/requested. Which -- the GA make problem or the /etc/bashrc problem? Not having the GA's is making working with the VM difficult. I hope you will look into that issue first. Thanks. checkIt will shows you "kernel"
Nope. I've done the upgrades -- cards tells me everything is up to date already. As far as "putting it back," if you mean the bashrc file, I expect it to do the same thing it did before, which is namely to scramble the bash window. Why would it behave any differently now?